The Scratch 5 Machine is a scratch and mar testing instrument for macro scratch. It is a research grade polymer, coatings, films, and bulk materials tribology instrument, capable of exploring scratch, mar, and other surface properties in a rigorous and meaningful way. Automotive, aerospace interiors, exteriors, and coatings. Consumer electronics scratch and mar resistance. Home and furniture scratch resistance. Industrial automation production line scratch and wear performance. Normal and tangential load (up to 400N), micron depth resolution, and high resolution tangential data at up to 2000 samples per second. Normal Load: 100N, 200N, 400N, 0.25% accuracy. Normal Load: 100N, 200N, 0.25% accuracy. Depth: 50mm, 2 micron accuracy. The Scratch 5 Machine applies real-world loads at macro speeds. Up to 400 mm per second at up to 400 N of load. Velocity: 1 to 400 mm/s, programmable. Load: 1 to 400N, progressive profile or constant load, programmable. Rising, falling and constant-load scratch and mar. Capable of reciprocation (wear) and indentation. Replicates a variety of industry standards including ASTM D7027-05, ISO 19252-12, ASTM D5178, TAMU/Avery-Dennison Mar, Ford 5-finger, Erichsen cross-hatch, pencil-hardness (dead load), Volkswagon PV3952, GM 14688-A-10N. Surface Machine Systems is a member of the D20 ASTM committee and works with the PTC SCRATCH Consortium and other industry partners to help develop and promote rigorous tribology standards. The G5 machine is fully programmable from 1 to 400 mm/s, and loads from 0.5 to 400N (depending on configuration). Each test can be run as a progressive load, using any valid load range as a start and end point. You can dial specific strain rates to test for specific material features. 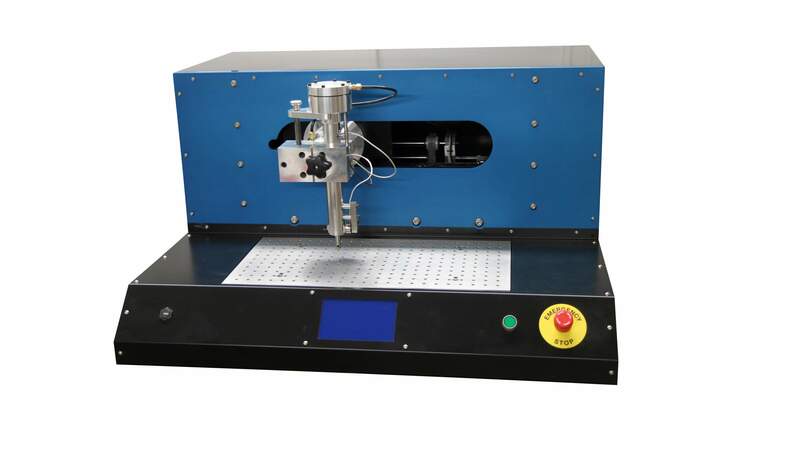 Turn Table This automatic or manual plate is used in conjunction with cross-hatch testing to help improve the testing speed and reliability of these types of tests.